February 11th, 2014, 5:01am :: The Los Angeles Unified School District's board is scheduled to green light $66 million in wifi upgrades Tuesday, bringing the total reported costs of wifi upgrades need for its 1:1 iPad proposal to $795 million. With that, iPad and wifi costs together would exceed $1.3 billion if the program is expanded to all district schools. Officials did not take into account which schools were wifi ready at the start of the iPad program, so thousands of iPads went to schools that weren't equipped to get them online. District officials have been scrambling this year to schedule upgrades. At a committee meeting last week, they reported 225 school sites now have enough bandwidth for all students to have iPads. The remaining 524 still aren't wifi ready. "We can't just go to Best Buy and buy a few things off the shelf and put them in our classroom," said Ron Chandler, L.A. Unified's chief information officer. "This would revival a Southwest airlines. This would rival an OfficeMax. 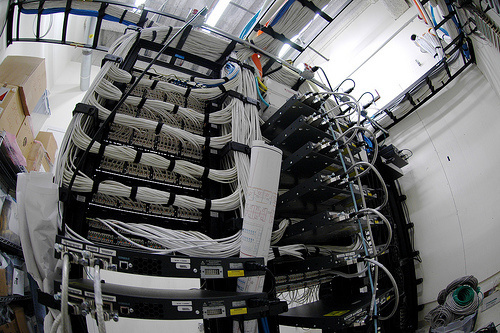 You got to think about something like that when you think about the size of this organization from a technology perspective." 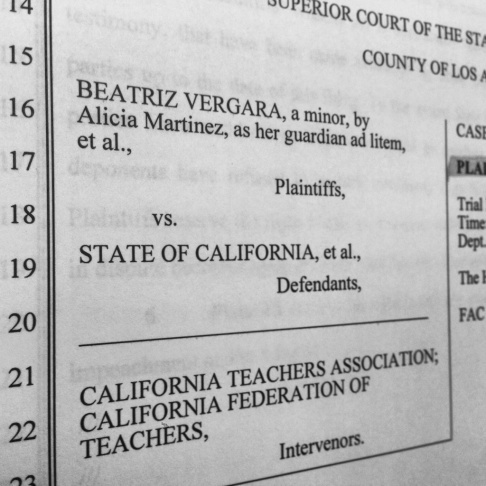 Adolfo Guzman-Lopez/KPCC | The Vergara v. California lawsuit challenges state teacher job protections as unconstitutional. The February 10th, 2014, 6:50pm :: first of several student plaintiffs — who have sued California claiming teacher job protections robbed them of an adequate education — took the stand in a Los Angeles Courtroom Monday afternoon and described how a teacher denigrated him in fifth grade. “She pulled me to the side and talked to me negatively and told me I wouldn't amount to anything in life,” 17 year-old Brandon DeBose told Superior Court Judge Rolf Treu, who will be ruling on the case. Outside the courtroom, defense lawyer Jim Finberg said that teacher had been named teacher of the year in Alamada. Dressed in a dark, pin-striped suit, turquoise colored dress shirt and tie, DeBose described his Oakland neighborhood high crime and low income. He said his tenth grade teacher was incompetent. Plaintiff’s lawyers argue DeBose had bad teachers because of job protections — such as permanent status after 18 months, a complicated dismissal process, and seniority based layoffs that shield grossly ineffective teachers from firing. 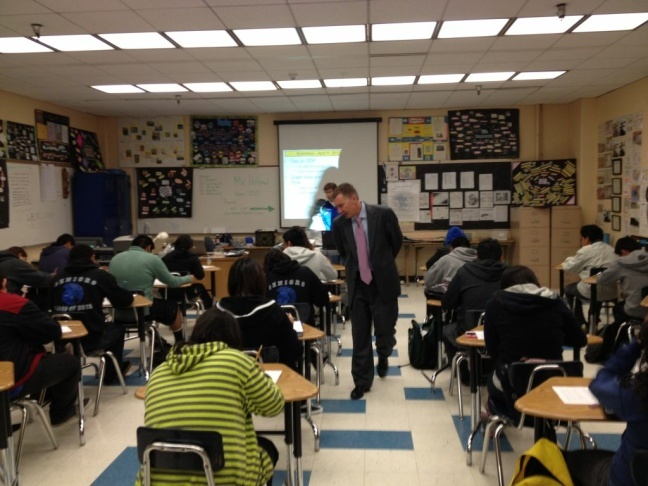 Superintendent John Deasy walks through an economics classroom at Los Angeles High School. Deasy is set to address the district's new arts education plan at Tuesday's school board meeting. The plan was released over the summer without financial details that were due July 1. February 10th, 2014, 1:18pm :: More than seven months after financial details for Los Angeles Unified's new arts education plan were due, district officials told KPCC Monday that Superintendent John Deasy will provide an update on the arts plan at Tuesday's board meeting. But it's unclear whether he will release the long-awaited budget, which advocacy organizations have been clamoring for. Little information - and no supporting documents - accompany the "arts to the core update" item on the board's agenda. Arts for LA launched a parent action center on Feb. 5, encouraging parents to pressure school board members for the budget. As of Friday, parents had submitted about 225 letters to their representatives on the board. The report was added to Tuesday's agenda on Feb. 5 as well. Arts for LA's executive director, Danielle Brazell, had first written to Deasy in January asking for the budget. She said she got no response.